Most tours are on a bus, Segway, or your own two feet. This tour takes you a little higher. 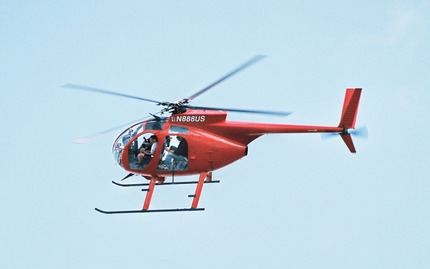 On this 45-minute helicopter ride, you'll fly over Downtown Chicago and experience the Loop in a way you'll never forget. Soaring over the city, you will see Willis Tower (formerly Sears Tower), John Hancock Building, Navy Pier, and get up close and personal with the Chicago River. You'll rise above the cityscape and experience Chicago's art, architecture, and all-around ambiance from the skies. It can only be described as breathtaking and unforgettable. Note: The price is $575 for up to three people -- the price is not on a per person basis. Please add the number of passengers and their respective weights in the 'Special Requests' field upon booking. Children ages 5 - 12 must be accompanied by an adult. No children under 5 will be allowed. Large carry-on bags are not permitted. Small camera bags and purses are permitted, at the discretion of the pilot. All bags are subject to search. All passengers are subject to FAA Security Screening. There are no refunds; all sales are final. Rescheduling is possible provided notification is received at least 24 hours prior to the scheduled activity. Even with a cloudy night this was one of the most memorable experiences I've ever had as a lifelong Chicago resident. Our pilot, John, was not only a fantastic pilot but also took the time to explain everything about the helicopter and its history. Will definitely be recommending to anyone willing to listen!